A Hindu Couple at Puja. Aarti: Ritual of worship in which light or lamps are offered to the deities amid devotional songs and prayer chants. Jagarana: Keeping vigil at night amidst much devotional singing as a part of spiritual discipline. All these rituals for puja are a means to achieve purity of mind and focusing on the divine, which Hindus believe, can be a fitting stepping stone to knowing the Supreme Being or Brahman. For the puja, it is important for a devotee to set an idol or icon or a picture or even symbolic holy object, such as the shivalingam, salagrama, or yantra before them to help them contemplate and revere god through the image. For most, it is difficult to concentrate and the mind keeps wavering, so the image can be considered as an actualized form of the ideal and this makes it easy to focus. According to the concept of ‘Archavatara,’ if the puja is performed with utmost devotion, during puja god descends and it is the image that houses Almighty. Dipajvalana: Lighting the lamp and praying to it as the symbol of the deity and requesting it to burn steadily till the puja is over. Guruvandana: Obeisance to one’s own guru or spiritual teacher. Ganesha Vandana: Prayer to Lord Ganesha or Ganapati for the removal of obstacles to the puja. Ghantanada: Ringing the bell with appropriate mantras to drive away the evil forces and welcome the gods. Ringing the bell is also necessary during ceremonial bath of the deity and offering incense etc. Vedic Recitation: Reciting two Vedic mantras from Rig Veda 10.63.3 and 4.50.6 to steady the mind. Mantapadhyana: Meditation on the miniature shrine structure, generally made of wood. Asanamantra: Mantra for purification and steadiness of the seat of the deity. Pranayama & Sankalpa: A short breathing exercise to purify your breath, settle and focus your mind. Purification of Puja Water: Ceremonial purification of the water in the kalasa or water vessel, to make it fit for use in puja. Purification of Puja Items: Filling up the sankha, conch, with that water and inviting its presiding deities such as Surya, Varuna, and Chandra, to reside in it in a subtle form and then sprinkling that water over all the articles of puja to consecrate them. Sanctifying the Body: Nyasa with the Purusasukta (Rigveda 10.7.90) to invoke the presence of the deity into the image or idol and offering the upacharas. Offering the Upacharas: There are a number of items to be offered and tasks to be performed before the Lord as an outpouring of love and devotion for god. These include a seat for the deity, water, flower, honey, cloth, incense, fruits, betel leaf, camphor, etc. Note: The above method is as prescribed by Swami Harshananda of Ramakrishna Mission, Bangalore. He recommends a simplified version, which is mentioned below. In the Panchayatana Puja, i.e., puja to the five deities – Shiva, Devi, Vishnu, Ganesha, and Surya, one’s own family deity should be kept in the center and the other four around it in the prescribed order. 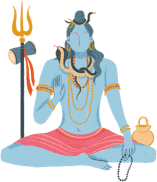 Bathing: Pouring water for bathing the idol, is to be done with gosrnga or the horn of a cow, for the Shiva lingam; and with sankha or conch, for Vishnu or salagrama shila. Clothing & Flower Decoration: While offering cloth in puja, different types of cloth are offered to different deities as is stated in scriptural injunctions. In the daily puja, flowers can be offered instead of cloth. Incense & Lamp: Dhupa or incense is offered to the feet and deepa or light is held before the face of the deity. During arati, the deepa is waved in small arcs before the deity’s face and then before the whole image. Circumbulation: Pradakshina is done three times, slowly in the clockwise direction, with hands in namaskara posture. Prostration: Then is the shastangapranama or prostration. The devotee lies down straight with his face facing the floor and hands stretched in namaskara above his head in the direction of the deity. Distribution of Prasada: Last step is the Tirtha and Prasada, partaking of the consecrated water and food offering of the puja by all who have been a part of the puja or witnessed it. The Hindu scriptures consider these rituals as the kindergarten of faith. When understood properly and performed meticulously, they lead to inner purity and concentration. When this concentration deepens, these external rituals drop off by themselves and the devotee can perform internal worship or manasapuja. Until then these rituals help a devotee on his path of worship. 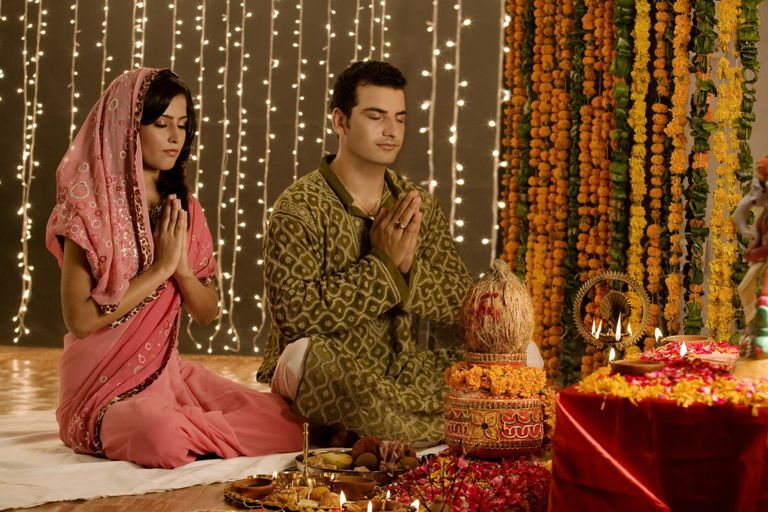 Do You Know the Symbolism Behind These Hindu Rituals? What Does Brahman Mean in the Hindu Religion? What's This? Hinduism and Math?